South Africaâ€™s stagnant land reform process has led to the frustration and delayed dispossession of many. With the conversation of landlessness comes that of occupation, and city dwellers have been occupying land for a long time in the hope of prompting government to grant them their promised housing and land. Land occupations have taken place all over the country for years like the Marikana settlement in Philippi, Cato Manor in Durban, and Doornfontein in the Johannesburg inner city. The Daily Vox explores land occupation in South Africa looking at examples of Brazil and Zimbabwe, where it is used as a strategy to gain ground for housing and farming in the urban and rural sectors respectively. â€œThe African National Congress had an opportunity to redress the issues of the past and give poor black people the right to access land but its 24 years down the line, and they clearly have failed,â€ Abahlali baseMjondolo Movement South Africa general secretary Thapelo Mohapi said in an interview with The Daily Vox. â€œNow that the ANC have lost credibility among the millions of people in this country, theyâ€™re bringing back the question of land,â€ Mohapi said. He said the motion to review section 25 of the Constitution which deals with property and land expropriation which was passed in Parliament in March will make no impact even if it is amended because government does not implement everything that is in the Constitution. â€œWe believe that it is time for black people to occupy unused land and use it for their benefit: build their houses, plant food, and use it for survival. We believe that the social value of land must come before its commercial value – survival before profit. In Parliament they are talking of land for profit, we are talking about land for survival,â€ Mohapi said. Abahlali does not believe land should be in the custodianship of one individual or the government. When political parties like the ANC and the Economic Freedom Fighters (EFF) speak about land expropriation without compensation, theyâ€™re mainly concerned with private property – taking land from white elites and giving it to black elites, Mohapi said. Or in the case of the EFF, transferring ownership of the land to the state. â€œIt should be people themselves who decide how the land should be used. Land should be discussed by grassroot movements – the occupation of land is also urban planning from below. 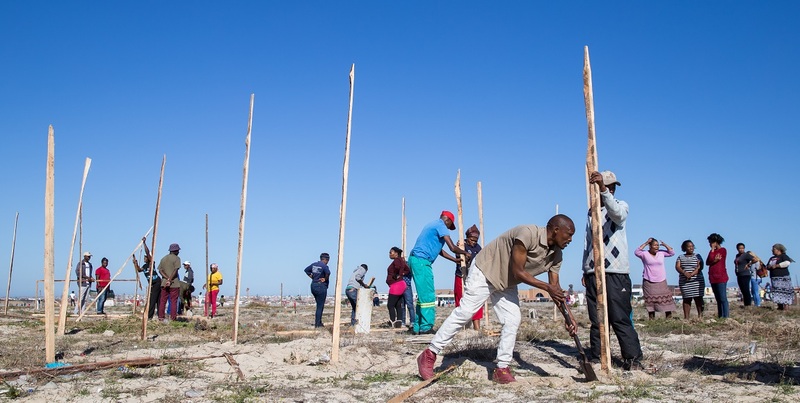 When people occupy unused land in the cities like we have done, it is for the benefit of those who are landless, those who were deprived by the colonial system and further deprived by the apartheid system,â€ said Mohapi. Members of Abahlali have faced state repression, state torture, and to date nine members have been killed by invasion units or hitmen by the local ANC government, Mohapi said. Local ward councillors have politicised the issue further by sowing discord and blaming the existence of informal settlements on foreign nationals. There has also been a political call for land occupation. Earlier this month, the EFFâ€™s commander-in-chief Julius Malema said at a rally on land expropriation in Thembalethu, George: “When we say occupy the land, we don’t say do an illegal thing. It is a right thing to do because it is your land. How do you say we are wrong by asking people to go and occupy what belongs to them?” he said to a sea of cheering supporters. Malema has been in and out of court where he is facing charges relating to his calls for illegal land occupation. The EFF leader faces charges of contravening the Riotous Assemblies Act after calling for fighters to occupy land at the EFF elective conference in Bloemfontein in 2014.
â€œLegally the situation is that you can be deemed a trespasser if you occupy someone elseâ€™s property without their permission,â€ Professor Ben Cousins, National Research Foundation (NRF) chairperson in the Institute for Poverty, Land and Agrarian Studies at the University of the Western Cape said in an interview with The Daily Vox. There are grey areas within the law – the state or private landowners have an obligation to find homeless people alternative accommodation before expelling them. Both Brazil and Zimbabwe have used land occupation as a tactic to acquire urban and rural land respectively. Housing is a pressing concern for many of the urban Brazilian population. The Homeless Workersâ€™ Movement has become one of the largest social movements in the country. Despite the 2009 My House, My Life programme designed to help families buy their first home, 11 million Brazilians live in favelas or slums. The two major sporting tournaments the country hosted – the 2014 FIFA World Cup and the 2016 Olympics in Rio de Janeiro – kindled evictions from the favelas and an acceleration in gentrification processes which pushed up rent especially in informal communities in highly sought-after areas on the property market. The working class was pushed from the periphery, farther away from their where they work, in cities plagued by endless traffic.This coincided with the economic crisis and rising unemployment. It was also accompanied with police brutality and the emergence of paramilitary groups that had taken control over a large part of the favelas in Rio de Janeiro. The Luta Popular movement, a grassroots movement for land-use planning, emerged in 2011. It’s fundamental tool to protest these injustices is occupation: it identifies unoccupied land and establishes the social function of the property by housing families in it as per the constitutional principle to establish the social function of property. This is followed by the collective process of setting up a school and catering for other needs not covered by the state through self-management. Despite how â€œending up like Zimbabweâ€ sends chills up the spines of certain South Africans, our neighbouring countries land reform – which arose from occupation – has been relatively successful. In 2000, the white farms in the country were mostly under-used and war veterans were tired of then-President Robert Mugabeâ€™s inaction. The war veterans – of which current President Emmerson Mnangagwa hails from – moved against him, carefully organising a campaign over the Easter weekend that year, where 3 000 huge white-owned farms were occupied by 170 000 Zimbabwean families. Initially, Mugabe opposed the move, but quickly reversed his position when he saw the popularity of the occupation â€“ and happily took the blame for the occupation by the British press and media. His government legalised the occupation and small farms were marked out on the formerly white-owned land. The new farmers received scant support which was exacerbated by the poor economy and hyperinflation of the 2000s. But the 146 000 smaller farmers with six hectares of land saved, reinvested, and became highly productive â€“ creating over 800 000 jobs. Vibrant market towns have grown up around the land reform farms, development economist Ian Scoones points out. About 23 000 medium-sized farmers with land of 10 to 50 hectares had limited capital to get going and farmed only part of their land. Their limited production did not earn enough revenue to buy the fertiliser and tractors needed for the larger farms. When Mnangagwa was still the countryâ€™s vice president, he spearheaded the Command Agriculture programme which was aimed at this group. With this programme, government provided seed, fertiliser, tractors, and fuel for ploughing – and the cost was deducted from the sale price of the maize and the programme more than doubled its credit in their maize production. In fact, Zimbabwe produced more maize in 2017 than was ever grown by white farmers. Zimbabweâ€™s other success has been tobacco, which generated US $576m in 2017 â€“ mainly by land reform farmers. The negative perception of Zimbabwean land reform â€œis an ongoing refusal of lazy people in the media and people with ideologies in the policy process to engage with the evidence,â€ Cousins said. It suits certain kinds of narratives, â€œthe narrative that we need to protect private property at all costs, that only large-scale farming is productive, that smallholder farming is inherently inefficient and unprofitable,â€ he said. This doesnâ€™t mean that land reform in Zimbabwe has been wholly successful. There are some real problems in Zimbabwe, Cousins said. One is that earnings from horticultural export-oriented crops – like fruit and flowers – which were farmed before the occupations have disappeared. This does contribute to the shortage of foreign currency in their economy – which is a major problem in their economy. Cousins does not think it is likely that rural land occupations will take off in South Africa the way it had in Zimbabwe. â€œPerhaps we will see a different occupation which might happen as a form of political protest,â€ he said. This could happen with a number of land activists occupying a piece of land on a symbolic level saying its restitution claims are valid and unresolved, and need attention to be implemented. Activists might occupy the land, put up tents, wave signs and flags, and then peacefully and strategically retreat once the protest has captured the attention of the media, the wider society, and key policy makers. Either way, occupation could play a key role in the conversations about land to come. After researching the claims made here, this Cousins, along with the author whose work that he primarily cites named Ian Scoones, appear to be Marxian pseudo-economists and ecstatic believers in collective punishment over individual rights, who may very well be whom the ANC is listening to when they claim â€œwe will not have the same thing happen to us as Zimbabweâ€. For almost 10 years they have peddled the monumental pseudoscience that Zimbabwean land redistribution was, verbatim, â€œnot a disasterâ€ â€œnot a failureâ€. The entirety of this claim to â€œempirical evidence debunking the widespread mythâ€ seems to be based on one single, solitary principle: cherry picking.